“but what bird is that?” he asked. K poked her head up in the blinds and told us it’s a red one… a little red one. 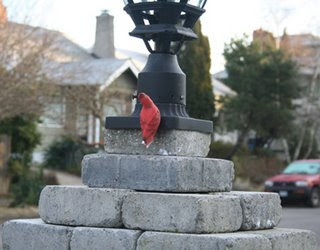 I said it could be a cardinal… that’s the only kind of bird I’d seen that was really really red. “Mike, I think it is D E A D” I had to spell it, I didn’t want to say dead bird in front of K.
“No it’s not” he blew off my dead bird theory. It sat there so still I was convinced it was dead, frozen in place where it landed. “Get a picture” he said. I went to our bedroom window and snapped a shot… then to the front window for a better angle… I swear the little guy wasn’t moving at all… he had to be dead. “I’m going out there” I said as though I were off to fight a giant beast with a bendy straw. Mike immediately wanted me to wash my hands fearing the filth it had accumulated on it’s journey to our house. Later he went out to investigate who may have left it there (my theory being some one drunk on their way home from the bar, seemed like something I might do in that situation many years ago). His investigation lead him to the pieces of it’s tale that were broken off and candy wrappers littering our front steps . “Kids” he said. That’s awesome! That’s the kind of “vandalism” I can get behind. No one ever leaves birds in my yard. Just beer bottles. I need a better neighborhood. OMG that’s where I left it!kidding.that is a strange story, but not as strange as the meat guy. . .
did you ever feel like a dork taking pictures of maybe a dead bird….or a fake bird? lolStuff like that happens to me. I’m not saying you are a dork…I’m just wondering if you felt like one? Vandalism where people give you decent stuff?’Round here we get stuff like paint ball splothes on the fence. Not something we’d want to keep.Chirp Chirp! Happy Birdwatching!p.s. thanks for the postcard! If I can ever get this scanner to work, I will scan and post it like you asked. That’s my goal. The scanner seems to have something else in mind. um. yeah. ok. slacker. you ok? I enjoyed reading it the second time almost as much as the first. The first time I snorted water through my nose because I kinda sorta knew what was coming. Trouble- that’s what I be! Got the post card!! You’ll have to email me you address, I’m going to the southeast coast of England late next week. My first time so a perfect excuse to send post cards. There is a group in Tucson called Ben’s Bells that spends the year hand-making hundreds of these beautiful ceramic wind chimes. Volunteers from all over Tucson do this. Each wind chime is a mish-mash of hand made pieces fired and glazed from the imagination of whatever 10-year-old or 70-year-old put the chime together.One night a year, these volunteers gather-up that year’s harvest and wander through Tucson, leaving them in random places for unknown people with a little note attached. I received one on my bike at the University of Arizona, after a library all-nighter before a final. It is probably my favorite thing.”Ben” was a two-year old who suddenly died on Good Friday, 2002. His family started making Ben’s Bells to heal from his loss, and to spread kindness throughout the world in his memory. So, I don’t know who’s stone bird this was, but maybe it was an act of kindness? You’ve got me crying into my cherry coke. How beautiful Chadness.It is those little things that people do that make such a huge difference in someones life. That was so funny, yet very odd.We had a neighbour who loved ceramic things in his garden.He had gnomes.We woke one morning to find they’d all been painted yellow in the night.We were quite disturbed.No postcard yet but that will be due to the postal strikes we keep having probably.Glad Disney was good. mwaaaaaaaaahahahahaaaa… thats so cute and strange!